Here is an unusual rig. Emblems removed. Photo from John Frances. If memory serves it is Evans Auto Railer. Evans Auto-Railer. 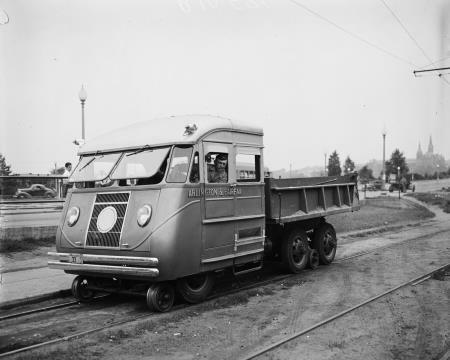 Probably based on a Ford truck chassis with possibly, a Thornton tandem conversion, judging by the twin spring suspension. Auto-Railer. I've seen a few GMC CCKW fitted with this, but not sure the GMC rear bogie would accommodate the rail wheels between the intermediate and rear axles, most of the Auto-Railer rear equipment setups trail behind the back axle.